Sweet Pea, the Beaglier stayed here at Shoeful of Drool for a few nights last week. Her house needed some repair work so Sweet Pea’s mom and I figured with all the workers going in and out of her house, Sweet Pea would be less stressed at my house. Even though I was really looking forward to having a dog around the house again, I wasn’t quite prepared for 17 lbs. of high-octane, turbo-charged, throw me the ball NOW — Dog! She really is like a pinball bouncing off the bumpers so hard the machine tilts. 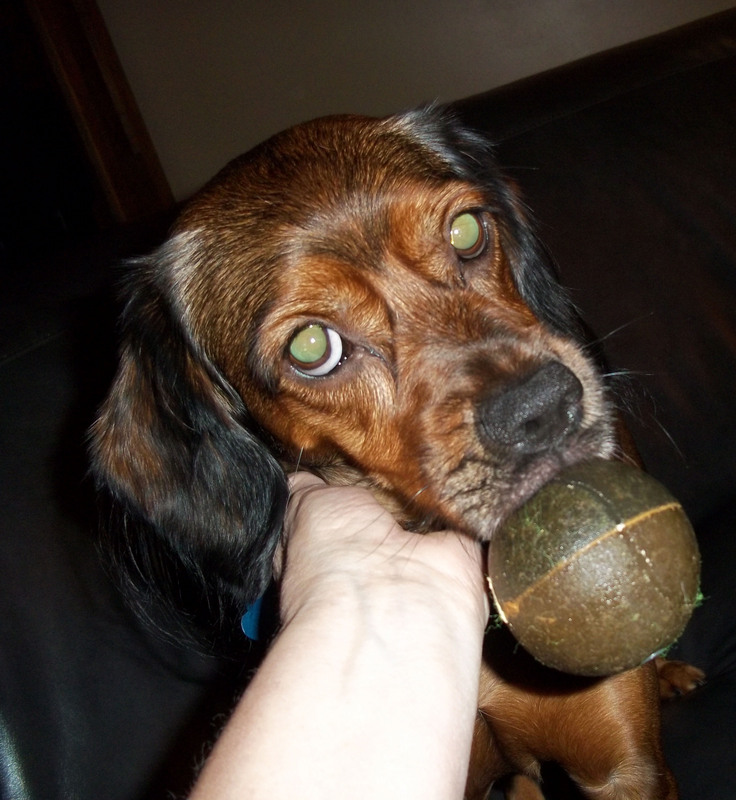 She loves her squeaky tennis ball and will chase it as long as you want to throw it. She carries that ball around in her mouth most of the time just in case someone says, “drop it so I can throw it.” In the picture above, she was dropping the ball. She likes the camera about as much as Dudley did (not very) and I couldn’t get a picture of her with the ball clenched between her jaws as she ran around the house. She looks like a kid who sticks the orange peel in her mouth to cover her teeth. But she is funny first thing in the morning, she jumps on the bed and puts her paws on my shoulders and looks down at me with that ball in her mouth — it has been awhile since I started my day with a hearty belly laugh! I highly recommend it. We went on an outing to Woof Gang Bakery where we had a little excitement, actually it scared me so bad my knees turned into jelly. Woof Gang is located in midtown where the traffic is very heavy. Sweet Pea and I were walking across the parking lot and I was going to get on the sidewalk by Starbucks where several people were sitting at tables outside enjoying the day. As we got closer to the tables, Sweet Pea began to lag behind and then she just sat down and squirmed out of her collar. I had a mental image of her darting into traffic on Six Forks Rd. (yes, there are roads named Six Knives and Six Spoons in the same area) and I just called her and she stopped and let me scoop her up. I carried her into Woof Gang’s where the very nice people working there let us chill out for a few minutes. We got several different goodies and it’s safe to say, I carried Sweet Pea back to the car and we went home and both had a cocktail. 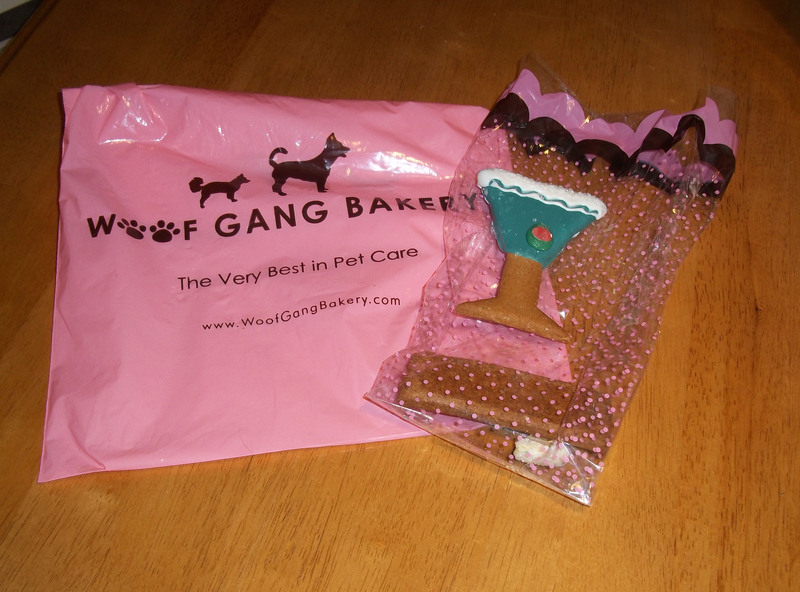 Sweet Pea enjoyed her “cocktail” while I gulped a glass of wine, this is just one bag of goodies we got from Woof Gang’s! I had forgotten that Sweet Pea is rather skittish around men and I think that may have been what spooked her in the parking lot. Several men were sitting at the outside tables .and since I didn’t seem to know them, she wasn’t going to go anywhere near them. This is one reason why I always used harnesses on Dudley and Zoe, they couldn’t squirm out of them and they really were much easier to control on our walks than when they just had their leash attached to their collar. I think I might have to get one for Sweet Pea for any future expeditions we take. 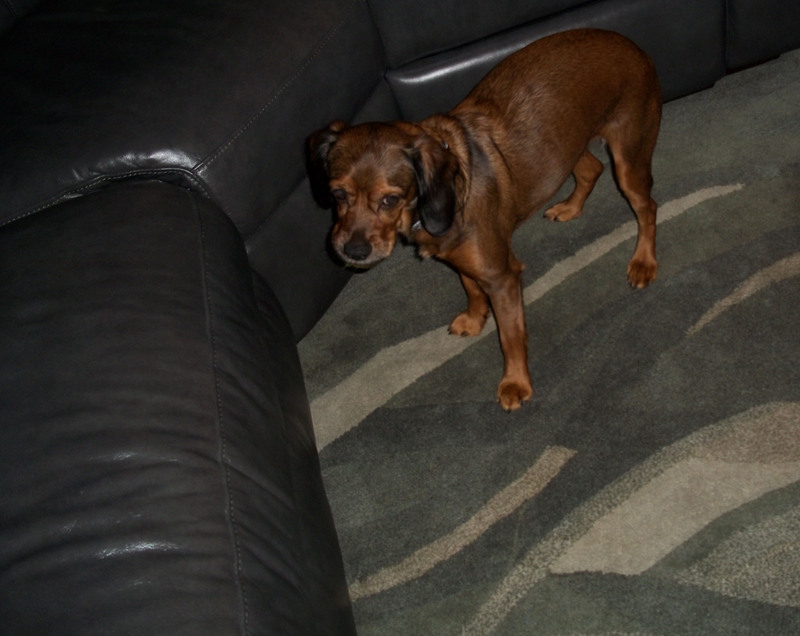 This entry was posted in Uncategorized and tagged animals, canine, dogs, Dudley, Sweet Pea, Woof Gang Bakery. Bookmark the permalink. 5 Responses to Sweet Pea Returns! Wow, I would have needed to chill out at the bakery as well. Sweet Pea sounds like a fun and energetic pup! I wonder if she and Lillie would get along. I’ll invite her over and see how they get along. Sweet Pea loves other dogs, it’s just men who scare her. Oh wow, that would make me so nervous as that collar came off! That has happened to me before with my dogs, and fortunately they just stayed where they were. Sounds like you had a fun day though! Dudley and Zoe both escaped me at one point or another, but it is a totally different fear when it’s someone else’s dog! Thanks for stopping by!